Built in 2015 and designed by Billy Blanco Designs, this sumptuous 6,317 square feet modern style home incorporates an open floor plan, soaring ceilings and dramatic floor-to-ceiling windows to achieve its unique design. 2-story home boasting 5 beds, 6 full, 1 half baths includes separate Master wing with impressive spa like bath and closet. Floating outdoor kitchen, full bath and lounge overlook the infinity pool and lush half acre with amazing mature trees. Gourmet kitchen with Quartz countertops, Sub-Zero, Wolfe and Miele appliances with built-in barista system. Features include cove lighting, Terrazzo, Ash Wood flooring and wall panels. Wet bar with dual wine cooler. Light filled study. Spacious media room. 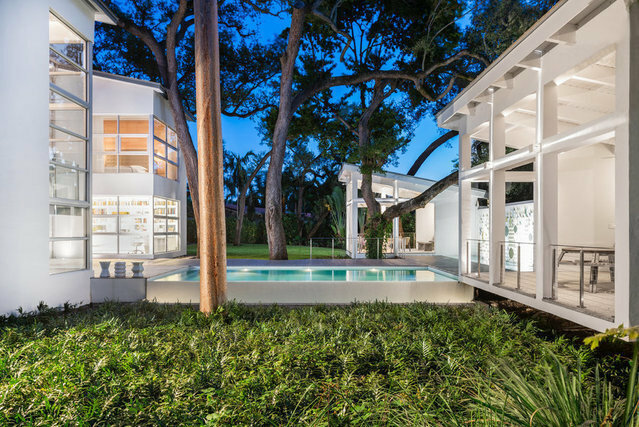 Located on a quiet street, in the best section of Miami Shores, one block from the bay.